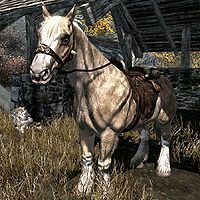 Frost is one of three unique horses in Skyrim and appears outside Black Briar Lodge once the quest Promises to Keep has been initiated. He can be obtained at the end of the quest if you persuade Louis Letrush to give him to you. If you mount another horse, Frost will remain wherever he was at that time. Frost has a stamina of 148, more than an average horse. His lineage papers are inside Black-Briar Lodge, in the basement. According to his lineage papers, his sire is Grane and his great grandsire is Sleipnir. Both are legendary horses from Norse mythology. Also, his dam is unknown, which is quite strange, since you can always know an animal's mother (unlike its father). Frost will attack if provoked but will run away mid-fight; he can then be found a short distance away afterward. Frost's name and the related quest may be a reference to the poem "Stopping by Woods on a Snowy Evening" by Robert Frost. Stealing Frost won't count towards your stolen horses, and double crossing Louis Letrush to keep Frost won't make him count towards your owned horses. Esta página foi modificada pela última vez à(s) 17h30min de 7 de março de 2015.